This is the battery that Canon Digital Rebel uses (EOS 300D), however, Canon Digital Rebel XT and XTI use NB-2L. Please make sure which "Digital Rebel" - if that's the camera you have. This battery is also compatible with many other cameras and camcorders. 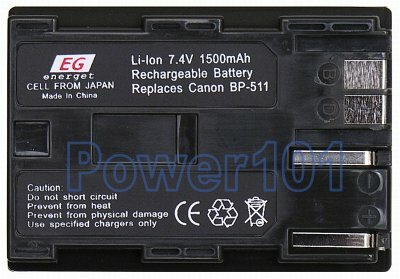 Almost all Canon DSLR cameras use this battery such as EOS 5D 10D 20D 30D. A lot of DSLR-like cameras use it too - PowerShot G1 G2 G3 G5 G6 Pro1 Pro90. Quite a few camcorders use it too such as ZR10 ZR20 ZR25 ZR30 ZR40 ZR50 ZR60 ZR65 ZR70 ZR80 ZR85 ZR90, Optura 10 20 50 100. Please check your camera/camcorder with our battery finder. For camcorder use, we recommend the mid-size battery as it should be rated for about 4 hours of filming which is usually what average events go for. The mid-size battery does not stick out too much from the camcorder so it still looks fine. The largest battery usually sticks out too much. In this case, the mid-size battery is BP-522, please check it out. 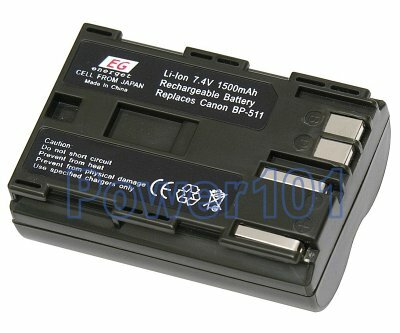 This battery can be charged with any charger compatible with Canon BP-511 or BP-512 batteries. Such as the charger that comes with your camera. Or if you have a camcorder - you can charge this battery inside the camcorder just as the original one.